This has been an exciting year in the Marcellus, with the Energy Information Administration (EIA) reporting that the Appalachian Basin is spearheading growth of natural gas development across the country. As the second largest U.S. producer of natural gas, Pennsylvania has continued to lead the Basin and the country in 2017. Here’s a look back at on a stellar 2017. Rig counts have remained fairly steady in Pennsylvania since this time last year, hovering around 30, according to Baker Hughes. And while this may seem low when compared to past years where the Commonwealth had 50-plus rigs operating, it hasn’t decreased the number of new wells being developed or lessened production by any stretch. According to data reported by the Pennsylvania Department of Environmental Protection (DEP), Pennsylvania saw 802 new unconventional wells developed, and as of October, the state’s Marcellus wells produced 4.4 trillion cubic feet (Tcf) of natural gas and 4.2 million barrels (MMbbl) of natural gas condensate, or natural gas liquids (NGLs). That’s an increase of more than 175 billion cubic feet (Bcf) of natural gas (4 percent increase) and 285 thousand barrels (Mbbl) of NGLs (7 percent increase), compared to October 2016 totals. There were also nearly 300 more new wells drilled in 2017 than 2016. Based on these numbers, Pennsylvania’s Marcellus industry will almost certainly beat 2016’s total natural gas (5.1 Tcf) and NGLs (4.7 MMbbl) production in 2017 – once again setting record production levels. We’ll find out for sure when November and December’s production data is released in 2018. The top three counties for new unconventional wells drilled this year were Washington (209), Greene (148) and Susquehanna (94). And while 19 counties had at least one new well in 2017, the top-10 counties for new wells accounted for 90 percent of all new wells, 84 percent of total natural gas production and 96 percent of total NGLs produced in 2017. Out of those counties, Washington County led the state in production of NGLs (3.6 Mmbbl) and Susquehanna County had the highest natural gas production (1.1 Tcf). But these two counties didn’t just top the charts for production, they dominated it. Susquehanna County produced 41 percent more natural gas and Washington County produced 1,702 percent more NGLs than the next closest counties (Washington and Butler, respectively). The top oil and gas production companies for 2017, ranked by number of producing wells, were Range Resources (1,262), Chesapeake Energy (848), and EQT (817). Chesapeake Energy and Cabot Oil and Gas led the state in natural gas production (628.8 Bcf and 625.6 Bcf, respectively), and Range Resources was the clear leader in NGLs production (3.2 MMbbl). 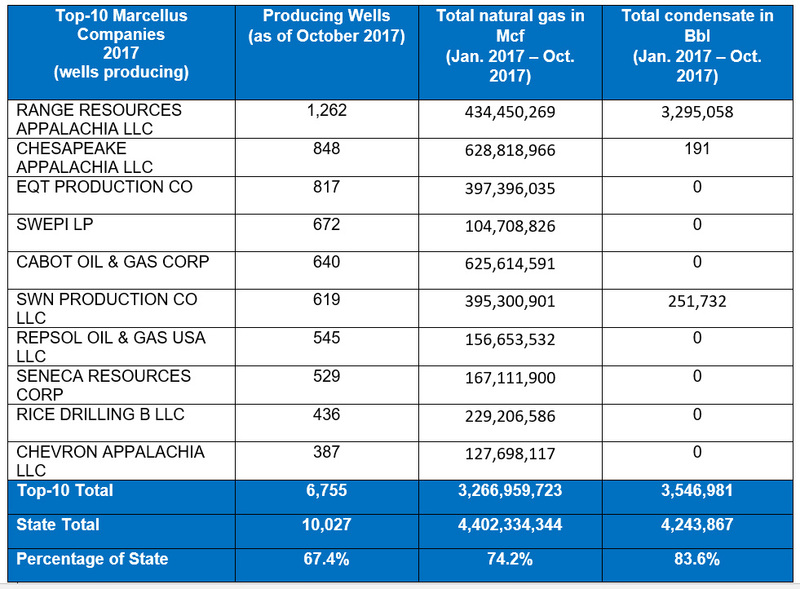 The companies with the top-10 number of wells currently in production in the Marcellus represented 67 percent of all producing wells, 74 percent of natural gas and 84 percent of NGLs production in 2017. After more than a decade, the Marcellus continues to impress. EID will update the following data again when the final months of 2017 are reported, but it’s worth taking a look now at just how amazing the growth in the Marcellus has been since Range Resources developed the well in Washington County that got this shale ball rolling here in Pennsylvania. From January 2004 through December 2017, Pennsylvania developed over 10,800 wells in 39 counties, and as of October, produced 26 Tcf of natural gas and 23 MMbbl of NGLs. The benefits from this level of development have been impressive to say the least. Today, the Commonwealth is seeing billions of investment dollars for infrastructure projects and new natural gas-fired power plants. An abundance of natural gas is helping consumers in Pennsylvania to save more, and state data confirms that economic growth in the most heavily drilled counties in the state is leading to improved health. And the abundance of NGLs has helped to bring new manufacturing and processing facilities to the state. Most notably, the Shell Appalachia ethane cracker plant is under construction in Beaver County, and will bring thousands of jobs and new manufacturing opportunities for Pennsylvania and the Appalachian Basin. 2017 has been an amazing year here in the Marcellus. Here’s hoping 2018 is even better!